The Nirmukta team apologises whole-heartedly and unconditionally to Chally Kacelnik for using her quote in an image that was posted on our Facebook group recently, without giving her due credit. We are truly sorry that we used the quote without attributing it to the source. Since then, after discussion with our team, Chally and many people who had commented on the image, we have taken down the image from our Facebook page. Procedures have been put in place to ensure that our moderators check the source of quotes and other content and properly attribute them before they are shared on our pages. 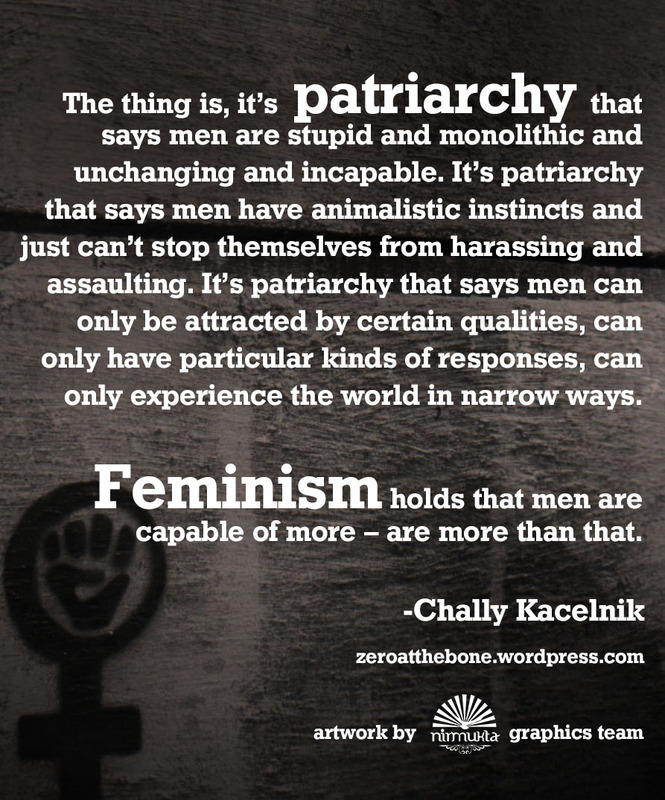 The thing is, it’s patriarchy that says men are stupid and monolithic and unchanging and incapable. It’s patriarchy that says men have animalistic instincts and just can’t stop themselves from harassing and assaulting. It’s patriarchy that says men can only be attracted by certain qualities, can only have particular kinds of responses, can only experience the world in narrow ways. Feminism holds that men are capable of more – are more than that. We look forward to seeing more great posts by Chally over at her blog and other places.